Rob Gottschalk RLA AICP Principal-Regional Econ Positioning | Vandewalle & Associates, Inc.
With over 20 years of experience, Rob Gottschalk is a leading expert in regional economic positioning, asset analysis and opportunities identification, and implementation. Rob focuses his skills on crafting economic development strategies and sustainable development opportunities for regions, cities, and urban centers. His unique asset-based and whole system approach uncovers opportunities that are truly rooted in a region’s place-based assets. Rob is passionate about making big visions happen on the ground and specializes in helping communities retool by developing the innovation capacity as well as centerpoints for emerging economies. Rob is also a seasoned project strategist, a skilled graphic communicator of complex ideas, and an inventive urban planner. Rob is currently working with the Water Council in Milwaukee, Wisconsin to prepare a Leadership Strategic Vision and implementation strategy to advance Milwaukee as an international Freshwater R&D epicenter. Racine’s Uptown Strategic Development Plan is another current effort that aims to revitalize one of Racine’s key employment, commercial and living districts. 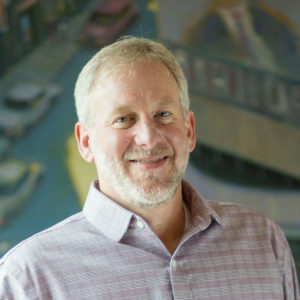 His work on catalytic projects continues with the Madison Gas & Electric economic development team, and he works with the City of Madison to reposition and redevelop the Capitol East District—the largest redevelopment project in City history. Rob is also leading development of an Economic Vision and Manufacturing Strategic Plan for the East Central Indiana Regional Planning District—bringing together the communities of Anderson, Muncie, and New Castle to collaborate and restructure their former manufacturing-built economy. Other regional projects have included asset and opportunity analyses for the seven-county Milwaukee 7 Region and the eight-county Madison Region in Wisconsin; and leading an economic positioning and Global Growth Initiative for the Quad Cities Region of Iowa and Illinois. These projects involve distilling a comprehensive analysis of the region’s economic and place-based assets, developing an economic and region building strategic framework, as well as crafting a compelling, aligning vision. Aligning corporate, academic, public sector, and nongovernmental executive leadership around a core vision and leading the early stages of implementation is critical in these large-scale, multi-faceted projects. You can email Rob here.